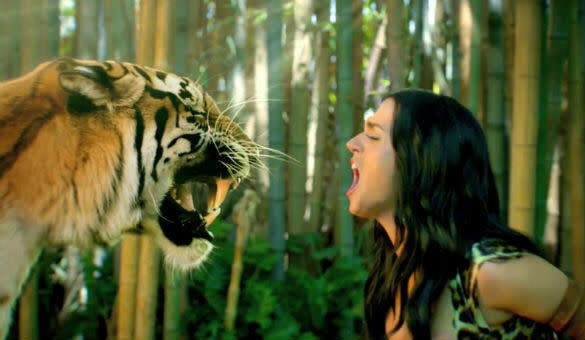 Katy Perry has come under fire from animal rights activists for featuring exotic animals in the video for her new single 'Roar'. The 28-year-old singer is seen onscreen with the animals including tigers and monkeys in the promo, and in one scene, the 'Firework' star even appears to paint the toenails of an elephant with bright pink polish. Russell Brand's ex-wife has now been criticised by the officials at People for the Ethical Treatment of Animals (Peta), who are furious with her decision to feature the endangered creatures onscreen. A spokeswoman for the organisation, Merrilee Burke told the Daily Star: "Animals used for entertainment... endure horrific cruelty and suffer from extreme confinement and violent training methods. They often become stressed and anxious when hauled around and forced into unfamiliar or frightening situations." Burke also claims the animals involved in Perry's video for 'Roar' were allegedly provided by a company who has been previously criticised by US officials, adding: "The Serengeti Ranch, the animal exhibitor that we believe supplied the animals for the Roar video, has been inspected by the U.S. Department of Agriculture 22 times since 2001, with a total of 13 citations during that time." Katy was previously praised by Peta and her ex-husband Brand was even gifted with a bullock from the organisation when they married in India in 2010.